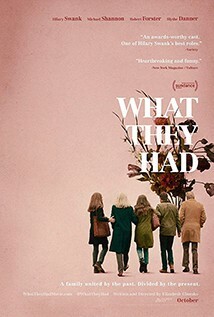 Bridget (Hilary Swank) returns home to Chicago at her brother Nick's (Michael Shannon) urging to deal with her ailing mother Ruth (Blythe Danner) and her father Burt's (Robert Forster) reluctance to let go of their life together. After Ruth wanders off in the middle of the night, Bridget flies across the country to convince her father to get help on caring for his wife. But Burt wants to keep his life together with Ruth for as long as possible, thinking the changes of moving her to a “memory care” facility would do more harm than good. Director Chomko’s grandmother was diagnosed with Alzheimer’s, and she takes great effort to recreate that unique sense of pain, where the person’s memories are lost but they are standing in front of you. Most importantly, she never forgets to focus on the joyous moments of love between the generations.